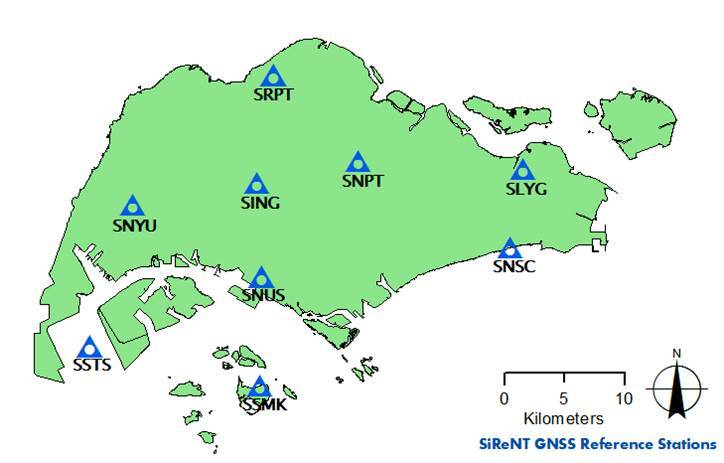 The Singapore Land Authority&apos;s (SLA) updated Singapore Satellite Positioning Reference Network (SiReNT) uses global navigation satellite system (GNSS) data from several countries&apos; satellites, not just the United States&apos; GPS data to correct satellite data for real-time precision of up to 3cm accuracy, according to a report by REACH Singapore. It is currently used by "auto riders" – self-driving shuttle buses – at Gardens by the Bay, and autonomous vehicle trials in one-north. With more potential satellites, users are more likely to get the required clear line of sight to satellites from any particular point. SiReNT&apos;s system processes and corrects satellite data to give a constantly updated, accurate position, which is used mainly for surveying and mapping. The Singapore Turf Club even uses it to ensure accurate lane markings on race tracks. But with its real-time updates and precision, SiReNT could also help Singapore&apos;s smart-city push in areas such as autonomous vehicles, said SLA deputy director of land survey, Dr. Victor Khoo. "When you want to automate something, you first need to know its position," he said. Regular GPS technology, as seen in mobile phones, is inadequate for autonomous vehicles as its accuracy is within a few metres, he added. Instead, SiReNT&apos;s GNSS capabilities are used alongside technologies such as sensors and lasers so that the vehicles can navigate with an accuracy of mere centimetres. Laser scanning and cameras are necessary for capturing surrounding data relative to the vehicle&apos;s position, noted Dr. Khoo. But real-time kinematic navigation – the method which relies on SiReNT – pinpoints the vehicle&apos;s actual position on the roads. Satellite positioning is also more suitable for locations such as Gardens by the Bay, said autonomous vehicle expert Niels de Boer. Laser-based systems need clear, defined edges to work well – and "trees don&apos;t have sharp edges", said Mr de Boer, programme director for future mobility solutions (autonomous vehicles) at Nanyang Technological University&apos;s Energy Research Institute. Many other countries do not have the benefit of a central set-up such as SiReNT, he noted. If someone wants to use corrected satellite data, they would have to buy their own system and servers, which could cost US$80,000 (S$116,000) to US$100,000. "By having this system available for the whole of Singapore, it saves a lot of money," Mr. de Boer added.